Next week we’ll talk a bit about pollinating birds–hummingbirds specifically. And when we talk about hummingbirds, it’s all about “trumpet shaped” flowers. You’ll hear and read more about trumpet creeper vine than you ever wanted to know. Besides, in my frigid part of the wold, trumpet creeper’s a relatively late bloomer and hummingbirds show up around Mother’s Day. These birds need to eat! And I am not one to mess with feeders, I’m sorry to say–not with the bears in my neighborhood. I might as well just hang out bear bait. 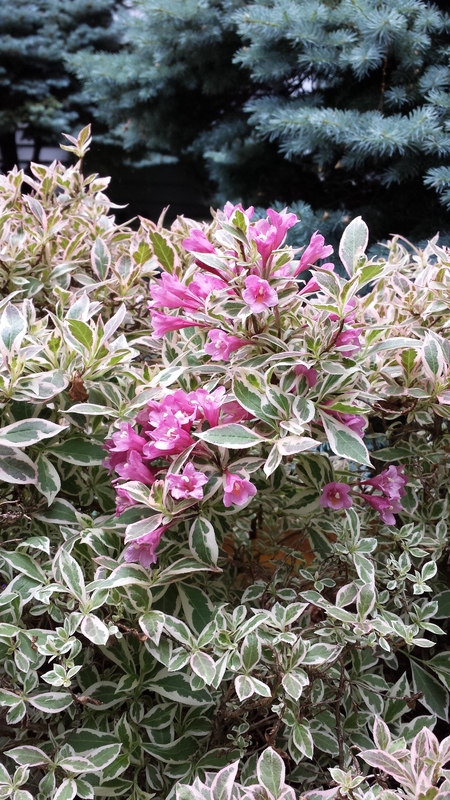 So after that digression, I’ll tell you about this close-up of a weigela that I’ve posted, above. This has been growing in a container for 8 seasons now. There are actually 3 of them in a 16″ container so you know it’s a dwarf shrub! It’s a lovely variegated variety, but since variegated plants tend to be less hardy for me (as do containerized plants) I over-winter the container in my garage. The variety is called My Monet. Normally I give it a light trim to remove any die back when it starts to flush to but this year I haven’t even done that yet. I will at some point. It’s a very easy care plant and the best part is that it looks good even when it doesn’t bloom. Were it not for the pollinators, I wouldn’t even care if it bloomed. All weigelas have trumpet shaped blooms and most bloom in the pink/red/maroon family. Some have a second flush of blooms in the fall. While they are not native and therefore are not has helpful as some of the native plants, my natives are not blooming at this point. I’ll have to post about those in July, I fear. Previous Article Can Wasps and Their Kin be Pollinators? Next Article While We’re Talking About Unpopular Insect Pollination….